How Much Weight Can I Gain? What Certifications Does QuickMass Have? 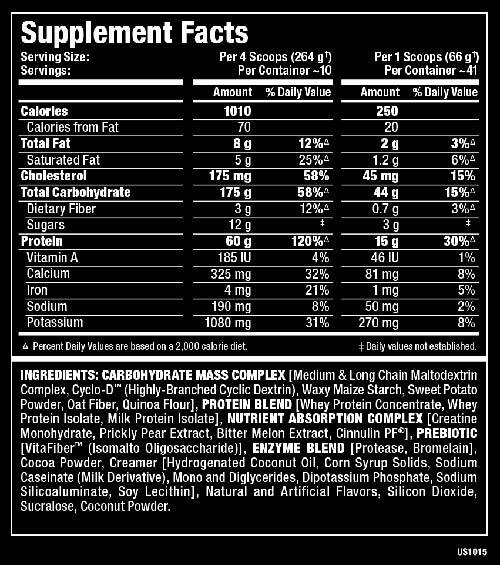 What's In QuickMass By Allmax Nutrition? How Do I Take QUICKMASS By Allmax? Rapid Mass Gain Phase: Four level scoops of QUICKMASS twice a day. Take the first serving between your first and second meal and your second serving immediately following training. Rapid Mass Gain Phase is ideal for those looking to put quality mass on fast. Maintain Phase: Two level scoops of QUICKMASS twice a day. Take the first serving between your first and second meal and your second serving immediately following training. The Mass Maintain Phase is ideal for those who have already completed the Rapid Mass Gain Phase and have reached their target weight, but now want to maintain their gains. Contest Preparation Phase: Following a prolonged contest preparation phase (limited calories combined with intense cardio-resistance training), use a 3-scoop serving between meals 1 and 2, then another 3 scoops immediately following training and another 3 scoops before bed. If you are training twice daily, your first 2 servings should be consumed following training. We have a large selection of in-stock AllMax Nutrition products including Weight Gain items and others for the lowest prices at SameDaySupplements.com® It's always easy to shop for QuickMass By AllMax Nutrition at SameDaySupplements.com® because you can browse by reviews, brand, prices or search for specific ingredients using our search tool. In-stock orders placed before 3pm EST ship out the same day to USA, Brazil, United Kingdom, Canada, Germany, Australia, Japan, India, France and worldwide at the cheapest prices online.